Julius will coach runners at Complete Wellness. At 10:30 AM every Sunday Julius will teach a one hour running technique class for all levels. "Complete Wellness is an advocate for the health benefits of running and a supporter of the elite Central Park Runners Club. Julius Mutekanga is a valuable addition to our team." Dr. Daniel Fenster, Clinic Director, is pleased to announce that Champion Runner Julius Mutekanga now coaches runners at Complete Wellness. 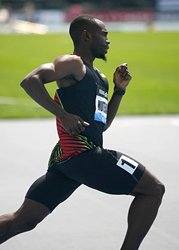 Julius Mutekanga is a Ugandan middle-distance runner specializing in the 800 meters event. He lives in New York City, NY where he is completing his studies and serving as a coach at St. Bernard's School. Julius qualified for the IAAF World Indoor Championship in the 800M run on 21 January 2012 and his time was in the top ten for 2012. He represented Uganda at the 2011 World Championships in Athletics and the 2012 London Olympics. Julius qualified for the World Indoor Championships on 9 March 2012 in Istanbul, Turkey. Julius Mutekanga currently competes for the Central Park Track Club (his qualifying time at the New Balance Games at the Armory was 1:48.00). Julius will coach runners at Complete Wellness. At 10:30 AM every Sunday Julius will teach a one hour running technique class for all levels. His office will be open from 10 to 12 on Sundays. "Complete Wellness is an advocate for the health benefits of running and a supporter of the elite Central Park Runners Club. Julius Mutekanga is a valuable addition to our team" said Dr. Fenster. ABOUT COMPLETE WELLNESS: Dr. Fenster and his team at Complete Wellness are located at 30 E 60th St in Manhattan and care for patients of all walks of life from athletes to office workers and from young to elderly, with an integrative holistic approach. Complete Wellness is a proud supporter of the Central Park Track Club.